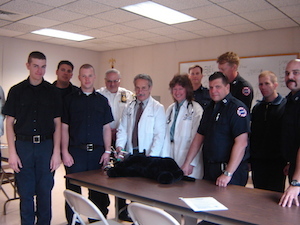 Dr. Dean Cerf, Hospital Director of the Ridgewood Veterinary Hospital, and Dr. Joanne Healey, Assistant Medical Director, donated a set of oxygen masks for pets to the Ridgewood Fire Department. Dr. Cerf and Dr. Healey demonstrated use of the masks and CPR techniques for pets rescued from fires or other emergencies. Captain John Sharo of the Ridgewood Fire Department said that most of the firefighters have pets themselves, and they were eager to learn how to help. Plans are being made for Dr. Cerf to train other members of the fire department, as well as the ambulance corps. The Ridgewood Veterinary Hospital will also donate oxygen masks to the Midland Park Fire Department, and encourages others to donate to their local fire departments as well. When attempting life-saving techniques, Dr. Cerf stated that one of the most important things to remember is to "never give up, because animals don't." Dr. Cerf recalled the fire at the Ridgewood Veterinary Hospital when it was located in a barn on Prospect Street in 1980, "We didn't have this equipment then, and had to improvise. The technology is much better now. It is critical to treat pets for smoke inhalation quickly, and if firefighters have access to this equipment, they may be able to help save the whole family in an emergency."